Updated 4 bedroom, 3 1/2 bathroom ocean front townhome in Kure Beach with fantasic views! Ocean Oasis is a newly updated 4 bedroom, 3 1/2 bathroom townhome located on the ocean in Kure Beach NC. The downstairs is a seperate unit and perfect for a small family or teenages and has a bedroom with queen sized bed, fooseball table, living room with futon and flat screen TV, kitchenette with sink and refrigerator, and full bathroom. 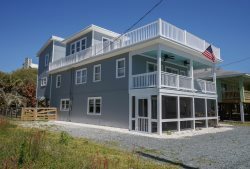 The main level has tons of light, great views of the ocean, a beautiful tiled floor, a full kitchen with granite countertops, and livingroom with spacious glass table. The third level has 2 bedrooms, one oceanfront with it's own ocean front deck, and a queen sized bed. The second bedroom has a bunk bed (full down, twin up). These bedrooms share a jack and jill bathroom (each with it's own sink and toilet, and one shower). The top level has a very large suite with full bathroom with 2 sinks and a whilpool tub, a king sized bed and a queen sized bed. The views from the third and fouth floor are incredible. This home is located in an ideal location in Kure Beach, close enough to walk to restaurants, the fishing peir, arcade, gas station, bars, etc.. but far enough away so the beach is too crowded (public parking is limited). You are a short drive from Carolina Beach's boardwalk, the NC Aquirium, and historic Fort Fisher! *Shady Beaches is another unit we manage which is next door to Ocean Oasis and may be availble if you need more space.